Built by Boeing at Seattle. Delivered to the U. S. Army on November 29, 1941. On November 30, 1941 took off from Boeing Field piloted by Frederick Eaton and flown to Salt Lake City. On December 6, 1941 took off piloted by 1st Lt. David G. Rawls as part of an unarmed ferry flight that departed Hamilton Field bound for Hickam Field. On the morning of December 7, 1941 incoming Japanese aircraft detected on radar were dismissed as the expected flight of B-17s. The formation of B-17s arrived during the Japanese surprise attack on Pearl Harbor and Oahu. This B-17 was fired on by U. S. Navy anti-aircraft guns and attempted to land at Hickam Field, then Wheeler Field, but both were burning from the attack. Finally, the bomber landed at Hickam Field but was strafed by an A6M2 Zero while landing. On the ground the crew fled the B-17 while Zeros continued to strafed, but none were wounded. One of the crew fired his pistol at the strafing fighters. 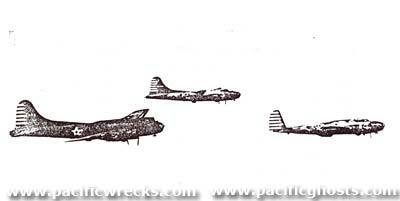 Afterwards, this B-17 flew reconnaissance over the Pacific Ocean around Hawaii. On February 8, 1942 departed Hickam Field on a ferry flight overseas to Australia. Arriving at Garbutt Field near Townsville on February 19, 1942. Assigned to the 19th Bombardment Group, 30th Bombardment Squadron. No known nose art or nickname. Possibly, assigned to the 28th Bombardment Squadron also. During the night of February 22, 1942 this B-17 was damaged when its left wing tip hit the wing and no. 4 engine of B-17E 41-241. This plane got a replacement wing tip from B-17E 41-2416. This B-17 was returned to flying condition the next day, but missed the Feb 22/23 mission against Rabaul. On March 13, 1942 participated in a bombing mission against Rabaul. Over the target, this bomber claimed one Zero. On March 16, 1942, this B-17 piloted by Charmichael was to evacuate General MacArthur from Del Monte Airfield, but the engines were unable to start due to mechanical problems. Charmichael did fly MacArthur on last leg of journey from Bachelor Field southward where he boarded a train. On a June 2, 1942 piloted by Frederick Eaton and Tower. During the mission gunners claimed two Zeros south of Lae and the bomber was hit by bullets but no one aboard was injured. Due to a Japanese air raid, this bomber was unable to land at Horn Island Airfield as planned and instead landing at Coen Airfield. During the landing, the tail wheel was smashed. Afterwards, Captain Spieth flew in replacement tail wheel assembly, and it took two days to clear a runway, then Spieth flew it back to Garbutt Field near Townsville. On August 16, 1942 took off piloted by 1st Lt. Dean C. Hoevet on flight to tests a new flare dropping mechanism. Aboard were several passengers to test the mechanism. During the flight, the mechanism malfunctioned and a flare exploded inside the bomber and caused it to crash into the sea and exploded on impact roughly a mile off Yorkeys Knob north of Cairns. Many of the bodies were not recovered including Hoevet. The entire crew was officially declared dead the day of the mission. Afterwards, Mareeba Airfield was renamed "Hoevet Field" in honor of the pilot, Major Dean C. Hoevet. The six missing crew: Hoevet, Androkovich, Lindsey, Sorrell, Stone and Chesser remain Missing In Action (MIA). All are memorialized on the tablets of the missing at Manila American Cemetery. Lindsey also has a memorial marker at Evergreen Cemetery in Braymer, Missouri. After his death, his community raised $300,000 to purchase a bomber nicknamed "Royal Gorge No. 1" in his honor. After the crash, the remains of five of the crew: Merker, Tarod, Hammersmith, Randall and Adams were recovered and buried at Townsville US Cemetery on August 23, 1942. On August 6, 1945, they were all reburied at Ipswich Cemetery. Postwar, these remains were transported to the United States for permanent burial. Four of the crew are buried at the National Memorial Cemetery of the Pacific (Punchbowl). Adams at A 133 Randall at B 503. Hammersmith at B 1101. Tarod at C 1262.